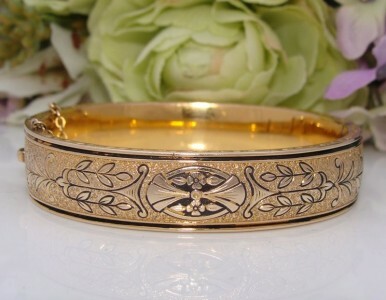 It is my pleasure to offer this Awesome Antique Victorian Revival Bangle Bracelet. It dates to around the 1920s-30s by design and styling as it is reminiscent of those Antique designs popular some 40-50 years earlier in the 1860s-80s. It is carved and stamped with a beautiful design comprised of floral, foliate and geo-shapes set amid a stippled background which sets it off superbly and catches the light at every turn. The design is filled with a black enamel-like material giving it the appearance of genuine enamel the technique of which is referred to as t’aille d’epargne or black enamel tracery. It is an enamel technique whereby an etched design is filled with powdered enamel then fired in a kiln. This same design is repeated on the back and is framed by the rib to the edge. With superb attention to detail, the edges are stamped with fan design – please see the pictures. The box & tongue clasp clicks closed securely and the hinge functions as new. The safety chain offers additional security. Near MINT Antique condition! There is no wear to the finish and just a hint to the enamel-like decoration which is not obvious. There are no dents, damage or repairs. 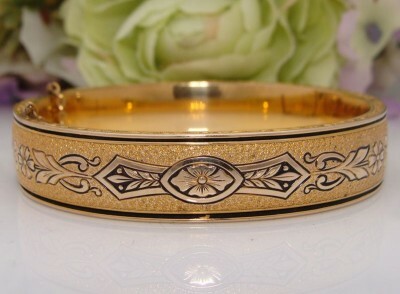 It is a Beauty on the wrist and I am sure you’ll be thrilled. Why not treat yourself to something special?